to a man. Such women commit adultery without considering the consequences in the sight of God and they can kill you (Husband) if they have the opportunity, just to keep sleeping with other men on the premise that "my husband is dead". Be very careful! 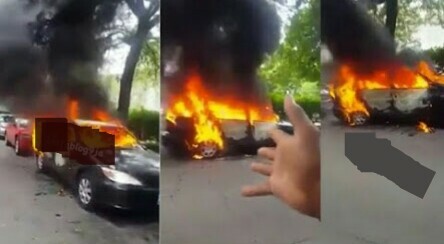 A Nigerian man had his car set ablaze live by his wife because he decided to divorce her over he reckless lifestyle. "She does drugs, she Prostitutes, she doesn't work"...and he said he can't continue to live with such a character. The wife, in the usual entitlement mentality of a demon-possessed lady, set his car on fire. Dear single men, whatever it takes, make sure you marry a Truly God-fearing wife, not a so-called slay queen or just a lady who goes to Church without living a righteous life. Your life and destiny depend on it.